It started about six months ago. I had been following Formula 1 for so long that I finally decided to sit in a car and try to go fast. Rather, I decided to sit in a kart. I had an idea of what a racing line was, had played enough video games that knew how grip worked and listened to enough of Martin Brundle and the Top Gear boys to understand the concepts of lift-off oversteer and slow-in-fast-out and all those truisms. Honestly, it helped at first but no amount of thinking and academic knowledge can make up for poor feeling and inexperience. I found that out early. So there I was, having decided that I was going to take up racing as much as I could afford. I cut my teeth on two courses; one north of Pittsburgh and another in New Orleans. I did the rentals there every weekend I could. Fast forward six months, and I’m standing in the drivers’ meeting for my first karting event. It wasn’t a real karting event, whatever that means. 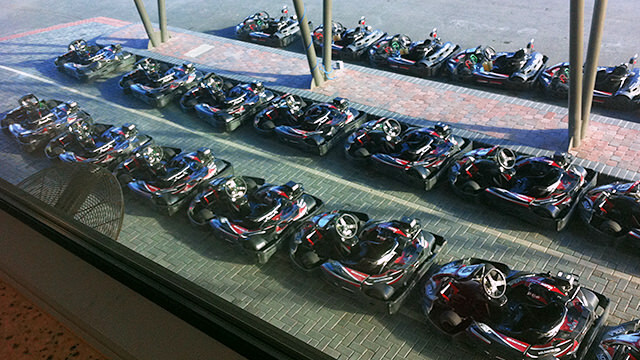 It was just a bunch of karting enthusiasts jumping in the rentals and tearing it up for a day. And boy-howdy was it fun. 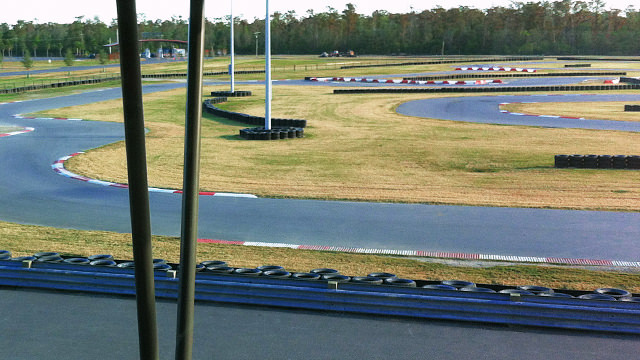 NOLA Motorsports Park opened in Avondale, LA (about 20 minutes from the French Quarter) just last year. It is a beautiful facility. Currently they have one race track for the big boys, a skidpad (or autocross pad), and the karting track... a nice one too. The programs they have for rental karting are, as far as I can tell, on par with some of the best in the USA. They have Arrive-and-Drive rentals, rental kart leagues, and oval kart leagues in addition to all the kart-owners events for the serious enthusiasts. 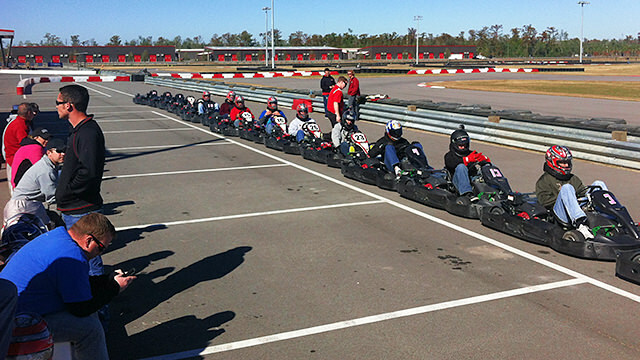 Kart-a-palooza is for my kind: the karting buffs with no kart of their own. The event consisted of four weight classes each doing 3 races: 15 laps on the rental track, 15 on the long, sprint track and 25 on the 1/8th mile oval. Each race was preceded by a 5 minute warm-up/practice/qualifying session. My only complaint on the day was that there were just so many people and the event took about twice as long as was expected. 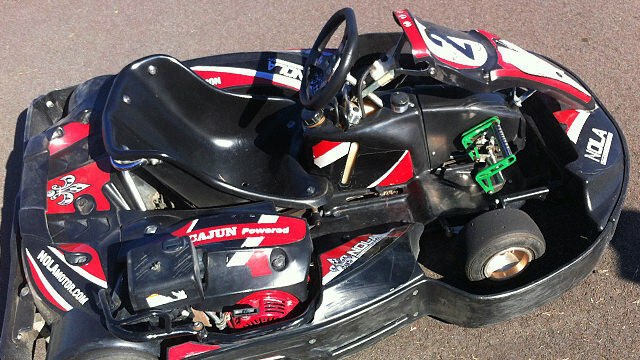 We were karting from 9am until 3:30pm. It was a long day. I’ll somehow find it in my heart to forgive them though as I would imagine karting is where these facilities make most of their money, and it was EPIC fun. Firstly, apologies for the terrible photo… I was taking it for studying, not for including in an article. 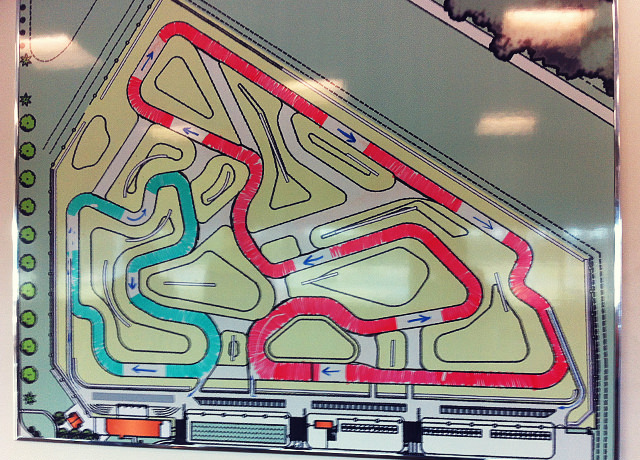 The rental track is the one you see in green here. It was pretty chilly that morning; somewhere around 43 degrees F. The engines had been idling for some time, but the tires and the track were like Teflon. I had hoped to get a glimpse of some of the lightweights practicing but they had us middleweights lining up as soon as they went out. Drat. I timidly suited up and got in my kart. This was the only track we were driving that day which I had driven on before, so I was fairly confident. I qualified P7 of 19. Pretty good for my first ever qualy session, I thought. We lined up and I quickly discovered how advantageous the inside line is. Up to 5th. Unfortunately, that also means back to 7th by the first left-hand corner. I held my own for the race and made my way up to 5th or so. A mistake pushed me back to 7th where I was determined to stay. The final few laps were exhilarating. I got a little fighty with 6th place who was also battling with 5th. I made it pretty close and passed them both at one point but was shuffled back quickly on the exit of the corner. White flag – of course I did something stupid to try to pass for 6th. The inside of a flat-out chicane is no place for passing. I spent the rest of the final lap driving like an idiot to keep 8th behind me. Thankfully it worked. It was partially due to the cold I was getting over, but I was panting for the last few laps. I mean, panting. 7th in my first ever race against real people! I’ll take that. The oval isn’t marked above, but it is incorporated into the long track; dead center of the main straight. I had no idea what to expect from oval racing. None whatsoever. I watch a fair amount of NASCAR and Indycar and understand the fundamentals of oval driving, but I couldn’t even imagine doing it myself on such a crowded track. Again, the lightweights went out for practice first and by the time the last people were entering the track, the folks who went out early were already jockeying for position. Wrecks. Lots of wrecks. Broadsiding, side-swiping, bump-drafting and spins were pretty common. A few got black-flagged. A full-course yellow even went out at one point. Madness. My practice was a bit more subdued, due in no small part to the stern talking-to we got from the course marshals. I went out about halfway down the order and started to get my feet under me. As you can see the oval is what the NASCAR world calls a tri-oval, meaning it has a slightly off-centered curvature to the back-straight. Charlotte Motor Speedway is a good example of this. I was aloof as to what line to take in the tri-oval. Obviously, tight in the corners and wide on the straight but people seemed to run all over the place in the back-straight. It took me until after practice and watching the other weight classes to discover that the middle line is by far the fastest. Also, that hugging the second apex of the triangle was the easiest way to pass on the inside. Practice felt okay, but I wasn’t quick. 14th of 19. But oh the race. Be still, my heart. This was not only my best race, but it was also the most fun. Talk to anybody and they’ll tell you I was the most concerned and not particularly thrilled about the oval but it was just incredible. Somehow between practice and the race I learned the fastest line, I learned how to pass and I learned how to stay out of trouble. I had a great start, especially considering I was on the outside. We started in the tri-oval and by the end of the main straight, I had already made up positions and was on the inside line. We continued racing and I continued passing. Some people spun off, I took other groups jockeying for position, and I simply was faster than other people on track. I ended up with the fourth fastest lap of anybody on track that week and seriously found my groove by the end of the race. I finished P5. The red outline indicates the sprint track in the picture above, but ignore the direction arrows. We did the track counter-clockwise. This was another course I hadn’t run on before. Perhaps more importantly, it was large enough that I couldn’t see the whole thing from the control tower and that I only had 4-5 laps in practice. The practice went fairly well but I never got a clear lap for a decent qualy. I had to start 13th, but was brimming with confidence after my run on the oval. The race started on the back-straight of the oval, so we had one corner before the main straight, and I got an incredible start. P11 was busy not paying attention, so I jumped to his inside and took three more before the main straight. I was also on the inside for Turn 1. “Keep your cool, drive your race” I kept telling myself. I think I remember a few people ahead spinning off on lap 1 so I was probably up to 5th or so by the end of lap 1. I had a bad run through turn 1 so I took the center line on the long, second straightaway to keep the inside for the sharp corner at the end but the kart behind me was right alongside. A little bump, a little too much speed and bang! I was facing backwards in the grass. If I had a Go-Pro, you would have had to bleep my commentary… a lot. It was back to P19 for Wheels. The rest of the race was actually pretty boring. I overtook a number of folks who had spun and a few people on track. Thankfully the race was close to 15-20 minutes, which meant I was able to concentrate and take a few more places. I ended up P11. 19th to 11th after a spin was pretty good, but I was still irritated for some time after the race. Ah well. C’est la racing. Practice, practice, practice. As I said before, knowing everything about racing cannot make up for feeling. As soon as your rear tires spin up when you floor it exiting a corner for the first time, you’ll get what I mean. Also, spinning in practice is not a big deal. Don’t be hard on yourself for spinouts. Braking up is the hardest part. At least it was for me. If you’re used to driving a road car and have no racing experience, the brake pedal feels nothing like you would think. Stomp on the left pedal after a long straight, and you’re going for a ride you can’t control. It takes finesse and I know I have lots of work to do still. Try practicing in the wet. You learn so much more about car control when the track is slippery and you have slicks on. This is not so much so one can learn about how to go quick when it’s rainy, but so one can learn more quickly about what grip feels like. To the guys at NOLA, I will be back as soon as I can make it. The next event I’m hoping for is an endurance race though if another Kart-a-palooza comes around first, I will be there. I’ve got the bug. Here’s hoping it’s stung a few readers too. On Track with Chris - Kart-a-palooza!